Pantone LLC, an X-Rite company and the global authority on colour and provider of professional colour standards for the design industries, recently announced a new plastic standard chips collection: Pantone Plastic Standard Chips Colour Collection Volume 1. Developed using on-trend colours for product design and manufacturing, the Pantone Plastic Standard Chips Colour Collection Volume 1 contains 154 of Pantone’s most sought-after colours. These include important selections from all major colour families, key-trending neutrals, lustrous metallic and vibrant neons selected from the Pantone Plus Series and the Pantone Fashion + Home Colour Systems. The Pantone Plastic Standard Chips Colour Collection Volume 1 features 154 of the most desirable product design colours that are popular in various markets including toys, consumer electronics, home furnishings, appliances and accessories. Perfect for inspiration and quick production, this cost-effective set will save users more than 60 percent compared to the cost of individually purchased Chips, according to the company. 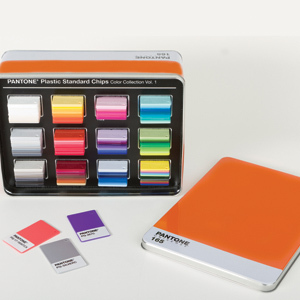 Attractively housed in a Pantone Universe storage tin, the large-format polypropylene Chips enable precise colour communication and colour control in plastics throughout the development process. With the ability to match all 3,400 standard Pantone Colours in the Pantone Plus Series and Pantone Fashion + Home Colour System Libraries, as well as custom colours, Pantone Plastic Standard Chips provide designers across industries — from industrial and product design to fashion accessories and toys — with an internationally recognised colour language for plastics. Pantone Plastic Standard Chips are sold individually, and now as collections, making it possible for designers to send complete colour specifications, along with their designs, to clients and manufacturers – increasing efficiencies, reducing costs and accelerating speed to market. Created using polypropylene, a plastic that closely aligns with materials commonly used in production, Pantone Plastic Standard Chips include both gloss and matte finishes in a large 3” x 1 7/8” format. These larger chips are tiered, ranging in thickness from 1mm to 2mm, making it easier to visualise, measure and match Pantone Colours in plastic. A small hole in the upper left corner of the chip lets designers conveniently group palettes on rings. Individual Chips include Pantone Colour names and/or numbers along with the corresponding pigment formulations and spectral data information.